Music is an important part of our cultural experiences, and it can also be a great learning tool! Even today, you could probably remember many songs from your childhood. Not only can music help with language development and memory recall, it can also help increase test scores in English and Math. When teaching about nature and trees to young children, songs can be a fun way to move and learn inside or outside. If you’re musically inclined, you could even pick up a few chords on a guitar for some of these songs and sing them without the aid of these videos. 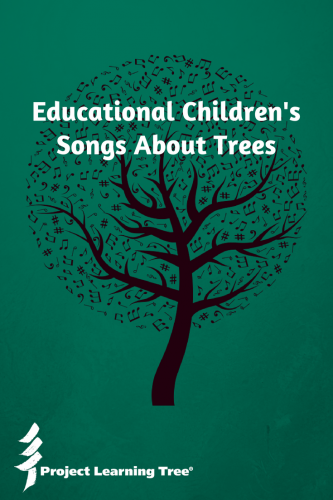 Use these songs when you’re teaching about parts of a tree, numbers, the seasons, or if you simply want to incorporate music into your science lesson. Plus learn about a Project Learning Tree Presents: Billy B Sings About Trees CD. We’re giving away 10 free copies! Using these songs, young students can learn the names of different parts of a tree – trunk, branches, leaves, and fruit. Some songs have familiar tunes like “Head, Shoulders, Knees, and Toes” and others have their own unique melody. These songs not only help teach about nature and trees, but also numbers and colors. These songs are a fun way for preschoolers to learn these important skills. Download a free sample activity from PLT’s e-unit for grades K-2: Treemendous Science! Especially in colder climates, trees can change drastically from one season to the next. Several of these songs use the familiar rhyme “London Bridge is Falling Down,” but with their own unique twist to talk about leaves falling down in autumn. If you’re doing a lesson on leaves and the changing seasons, you might also want to check out these leaf activities for young learners. Trees are home to many types of living things – mammals, birds, insects, and even reptiles! Even a quick walk around the school grounds can be a great learning opportunity to observe animals and birds living in trees in your own environment. You might also consider using this activity on exploring trees as habitats. Explaining how trees and other plants get energy through photosynthesis can sometimes be a tough concept to convey to young students. But this engaging video breaks down the process with a catchy tune that will help them remember how photosynthesis works. Since this song highlights trees found in more tropical areas, it can be a great way to incorporate geography into a lesson about different types of trees. You could also check out these fun facts about 10 trees from around the world. These two songs don’t necessarily have an educational component to them, but nonetheless, they’re fun songs to sing about trees! 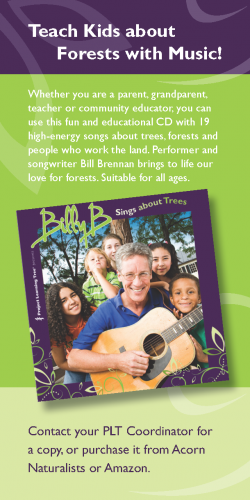 A few years ago, children’s performing artist and songwriter Billy B. Brennan teamed with PLT to produce a CD all about trees. Billy B has been writing and performing children’s song and dance shows with environmental themes since 1978. He educates through music, laughter, and audience participation. His energetic live performances get kids moving and making noise, capturing their attention while furthering their understanding of the natural world. Project Learning Tree Presents: Billy B Sings About Trees is his ninth collection of song recordings. The CD comprises nineteen songs, such as “My Roots Run Deep” and “The Rock and Roll of Photosynthesis.” Lyrics for the songs are included with the CD. Each song connects to a PLT PreK-8 classroom lesson. A Gift for the Holidays! Performer and songwriter Bill Brennan brings to life our love forests. Whether you are a parent, grandparent, teacher, or community educator, you can use this fun and educational CD with 19 high-energy songs about trees, forests and people who work the land. Suitable for all ages. You can purchase this CD from Acorn Naturalists or Amazon, or contact your PLT State Coordinator for a copy. Which song about trees is your favorite? Do you have any songs you would add to this list? Share in the comments below! Rebecca Reynandez is a Marketing and Communications Consultant and Principal of Spring Media Strategies, LLC. She has worked with nonprofits for the past 10 years and currently focuses on working with environmental organizations. She is based in Minneapolis, MN. Predators and prey animals use camouflage so they don’t attract too much attention. Here are examples of color matching, disruptive coloration, self-decoration, active camouflage, and mimesis. Engage students in STEM teaching and learning as they investigate the variables that cause leaves to change color with PLT’s Activity 78: Signs of Fall.